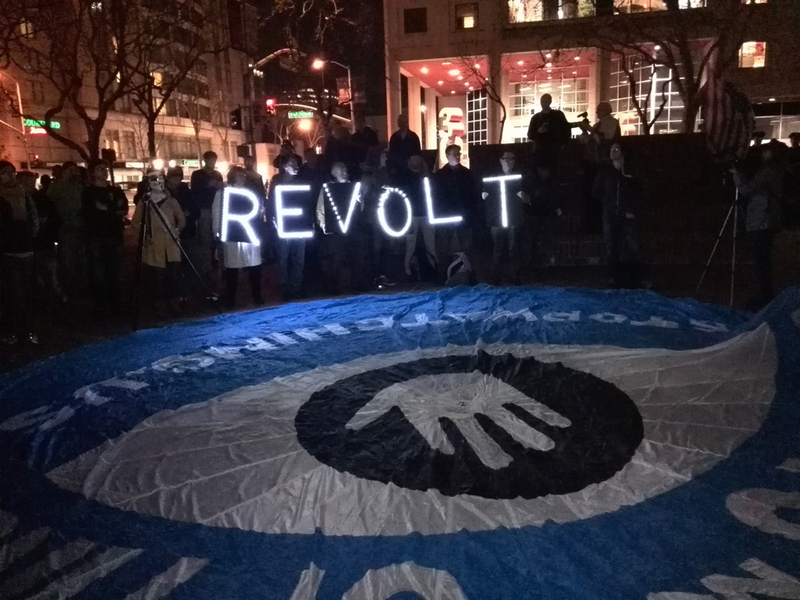 Hundreds of people concerned for their privacy and opposed to NSA spying practices descended on the courtyard of the AT&T building in San Francisco last night on a clement winter evening. The well-organized event, The Day We Fight Back Against Mass Surveillance, was flanked by police ironically attending to keep surveillance on the amassing crowd. Former AT&T technician and government whistleblower, Mark Klein, took to the stage sharing his story of how he discovered his employer was in cahoots with the NSA. Mr Klein told the assembled crowd that he had been tasked to work on the wire that would stream documents into a secret room and was shocked to find that both domestic and international customer activity was being tracked. “Here I am being forced to connect to a Big Brother machine,” he said. The evening’s proceedings included ample video footage projected onto a windowless side wall of the AT&T building. The popular Police song: “Every Breath You Take” (I’ll be watching you) played and people sang along as the lyrics were displayed before them. Media clips of TV news interviews with Mark Klein were shown as well as a clip of President Barack Obama’s address about the NSA which was robustly heckled. Passing cars during the city’s peak hour tooted their horns prompting an explosion of cheers and waving. The event kept to its allotted time from 6pm – 7.30pm and showcased an impressive list of speakers, as well as a local musician who sang a parody of the Eagle’s classic “Lying Eyes” to lyrics he’d coined: “Spying Eyes”. The crowd sang along to this song, too. Adding further color to the event, a giant anti-NSA themed blue parachute was waved up and down in the air by a circle of protestors. The event closed with a minute’s silence in emotional tribute to internet activist Aaron Swartz who took his own life in 2013. Protests are synonymous with San Francisco, not just tolerated, but most often celebrated. The Day We Fight Back Against Mass Surveillance event brought San Francisco citizens together to campaign for rights they say are stipulated in Fourth Amendment of the Bill of Rights. This is an event which is making its rounds online and through social media channels across the world. What about you? Do you see people such as Mark Klein and Edward Snowden as heroes or as traitors? Do you believe government agencies should have the right to spy on you, even if it increases your nation’s security? We‘d love to hear your thoughts.